A big update for Mail & Calendar apps is coming for Windows 10. The update brings many new features including Focused Inbox, Mentions, Interesting Calendars and more. More details below. The Mail & Calendar apps now separate your inbox into two tabs – Focused and Other. Emails that you likely want to act on appear under the Focused tab, while the rest remain easily accessible—but out of the way. What lands in your Focused tab is determined by an understanding of the people you interact with often, and the content of the email itself (e.g. newsletters, machine-generated email, etc.). You can turn this feature off or on at any time under Settings > Reading in the app. 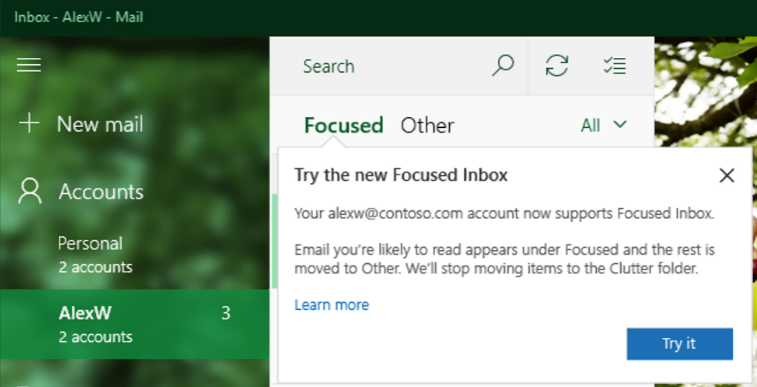 If you need to fine tune your Focused Inbox, just right-click on an email and use the “Move to Focused” or “Move to Other” options. 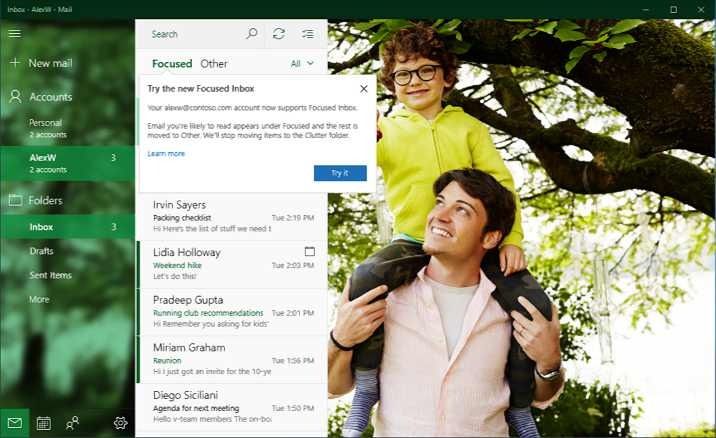 Get to emails that matter quicker with the new Focused Inbox. Mentions make connecting on email fast and easy. Simply add the @ symbol anywhere in the body of an email. This will bring up your frequent contacts as well as access to your directory. Once you pick the person you want to address their name is highlighted in the message in blue, helping them know they are being asked to take an action in your message. If the person isn’t part of the email conversation already, they will be automatically added to the To: line so they receive a copy of your email. Use @ mentions to quickly add contacts and get their attention. In addition, mentions helps you be aware of what you’ve been asked to do. The @ symbol appears in the message list for the messages you’ve been mentioned in, so you can see at a glance which emails require your action before you open them. There is also a filter so you can sort to see only the messages where you’ve been mentioned. Once you’ve opened the email, the blue highlighting of your name in the body of the email helps you quickly find where you’ve been mentioned. The upcoming update to the Calendar app, you will be able to categorize calendar events in a variety of color categories, enabling you to quickly scan and visually associate similar events, and plan your day better. This has been the top requested calendar feature, so our team is delighted that we could focus our work on what you want. Categorize events with colors to quickly scan and associate similar events. New Mail & Calendar apps is introducing Interesting Calendars, powered by Bing, so you can keep track of TV schedules and your favorite sports teams’ calendars. For example – it’s basketball season right now, so add the game schedule for any team you support or a rival team you want to keep track of. Over time we will add interesting schedules from various regions to this feature. Add interesting calendars to keep track of your interests. Mail & Calendar apps is adding simplified summary cards in your inbox and calendar enabling you to quickly get to travel reservations and package delivery details, check in for flights or change hotels and rental car reservations or track the latest packages delivery status at the touch of a button, and stay on top of these events with reliable reminders. It’s on by default, and you can configure this feature from ‘events in email’ settings in your account on the web. Stay on top of travel reservations and package deliveries. Now with Mail & Calendar apps you’ll see location suggestions from Bing so you can add popular addresses quicker, an option to add Skype for online meetings, a scheduling assistant for Office 365 accounts, a fun emoji picker, and a people picker to help you quickly browse and select contacts, when you create a calendar appointment. And when you want more details on someone in your calendar, you can now easily access the Windows 10 People app in one click. These updates build on the other recently rolled out features and improvements in the Mail & Calendar apps including ability to pop out emails from the inbox and to drag and drop calendar events, support for *.eml email and *.ics calendar event formats, and integration with Windows 10 taskbar calendar so you can easily glance at your upcoming appointments. See location suggestions–such as Starbucks stores in your city–when creating calendar invites. These new features are beginning to roll out to all Mail & Calendar users over the next few weeks for their Outlook.com and Office 365 accounts.